My oh my, it is time again to be retrospective and take a look back at last year’s posts for knit and crochet blog week. There we are asked to determine if we followed through on the goal we set for ourselves. Well, I went back and dug through my older blog (the one that is linked to my Etsy store back when I had time to hand-dye yarns…) and this is what I came up with! If you are in the mood, you can find this post from the 2013 Knit and Crochet Blog Week here. 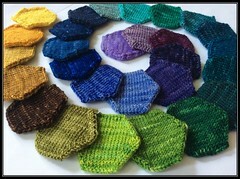 I did not fulfill all of my goals as my hope was to knit a beekeeper’s quilt using only yarns I had dyed. I made a pretty decent start, but after last Memorial Day, I sort of lost my spark and Miss Emme became a lot more hands on. So there went that part of the goal. I will give myself a bit of a pat on the back for being true to just one project after so long, even if I did decide to restart it. But I am focused this time and hopefully will be able to follow through on this goal with the addition of Sir W in July. So looking forward again, I hope to read that I continued working diligently on my beekeeper’s quilt and have added many beautiful and unique yarns to the mix! Let’s do this! When I first read the topics for this knit and crochet blog week, I knew that today was going to be the most challenging. The prompt recalls nostalgic stories of mothers, grandmothers, or [insert knitting family member here] happily clicking away and then passing on the art. Well, I didn’t have that experience at all. The women in my family were crafty with quilting and crochet. This is not to say that I didn’t try my hand at at crochet (quilting just didn’t interest me at that point). For the life of me, I could not figure out crochet because my left handedness just couldn’t wrap my head around how to mirror what my aunt was doing with her right hand. I absolutely loved the afghans that my aunt would crochet and I treasured the one she made for me as a child that was made from hot reds, oranges, and white. I could make a mean crocheted chain, but never knew how to build on that foundation. So I gave up on crochet for a while and did latch hook rug kits. And knitting was not a craft that any of my family members did so I had no experience with it. I immediately went to the bookstore where I purchased one of those idiot’s guides to knitting books. With that in hand, I rushed back to my dorm room, hoping that my roommate would be off with her friends somewhere so I could attempt this craft in peace. 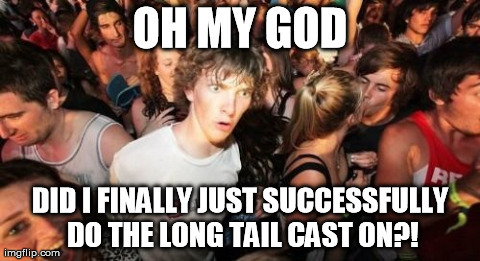 Well, she was gone but I just couldn’t figure out how to cast on. It started to feel very similar to my experience with crochet. ~sigh~ But I was determined to figure this out! I simply refused to believe that I was this bad at crafts. And that is how knitting and I first successfully got together. It has been a strong relationship every since. Even better, my knowledge of knitting helped me to finally figure out and master crochet as well! Day Six (Saturday 17th May): Views Of Others, Views Of Yourself. Write about another knitter or crocheter that you admire. This could be someone you know or used to know – an aunt that taught you to crochet or the school-teacher that used to run the after-school learn-to-knit club, or someone who you are aware of because of blogging or other areas of social media. Write about your feelings either for their work or what they bring to you as a knitter or crocheter. Reminiscences of the sound of your mother’s metal needles, or the description your grandad gave of what he’d knit as he sat on his bunk below deck in his sailor’s days are as precious as sharing the enjoyment of the work of a new indie designer or dyer. Spread your enjoyment to your readers. Next, think about if anyone has ever told you how they feel about your knitting, positive or negative. Have you delighted strangers who have enjoyed telling you how they would sit with their grandmother who loved to crochet doilies, or have you had to withstand a little brother telling you repeatedly that knitting is for grandmas? Today’s topic challenges knitters and crocheters to write a post in a way that is different from just the same old day to day style. 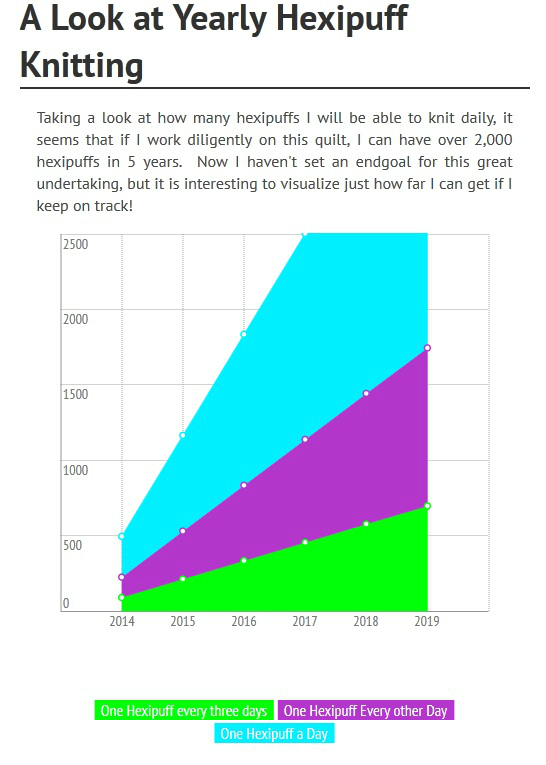 I decided to throw together and infographic that would help me visualize just how many hexipuffs I will have if I work diligently on this project over the next few years. When I initially put together the chart, I based my numbers on knitting 1 or 2 puffs a day. The numbers grew quickly and I had to reset my expectations. With a toddler and a newborn soon to make his debut, it is highly unlikely that I would be able to keep up a pace of knitting two, let alone, one puff a day. So I went in the opposite direction and divided yearly totals by 2 and 3. Much more doable, I should say! It’s the annual challenge to blog in a way different to how you normally blog. You may choose to create a podcast, or vlog, create a wordless post, a beautiful infographic or write in verse. You can post on any topic you like, but be sure to post in a style different from your usual blog presentation. There’s not too much guidance for this one simply because the more varied the posts are on this day, the wider the sources of information for other bloggers will be. I am the seemingly lowly weaving needle, but everybody has me in their notions bag. How could you not? I am one of the last tools to interact with your knitted or crocheted item and I help you tidy up the loose bits (literally). Now I know that there are other methods to weave in ends, but so many knitters get nervous and want to double back just a bit our long tails that have been knitted or crocheted over so I am always in some sort of demand. During my existence in KnittyKitty’s notions bag, I have been used quite a bit, but I must stress how much of a process it is with her. So many times I have peaked up out of the notions bag and let KnittyKitty7 know that it would be best to use me as you work through the project instead of waiting until the end. But oh no, in her excitement to see a project grow or get to that next color change, my advice goes unheeded. And then where do we find ourselves? As blankets are her usual knitting or crocheting MO, we typically end up with a nice sized blanket with soaring color shifts or a huge pile of intricate squares waiting to be joined. But the ends stand in the way. And then we have the deep sighs and the regret of not heeding my earlier advice. And then as she resignedly pulls me out of the notions bag to begin weaving away, KnittyKitty7 always vows that THIS is the last time she doesn’t weave as she goes. Ask me how many times that has come to fruition? When KnittyKitty7 started on her latest adventure, or great undertaking as she calls it, I knew immediately what drew her to the pattern. 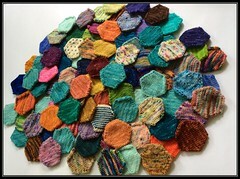 Each little hexipuff is double-sided so there are no ends to weave in! All of the ends can either be pulled into the center of the fabric with a crochet hook or left long to be used later for joining the puffs. You should see the delight on her face when all the finishing that is required is a simple crochet being inserted into a puff to draw the end through! I do believe she has forgotten that once again, at the end of the project, it will be her and I joining each hexagon carefully. I will bid my time in this notions bag as she works up of hundreds or perhaps even a thousand hexipuffs, discovers how she wishes to arrange them, and then has no other tool to reach for but me, her ever present, ever useful weaving needle. Day Four (Thursday 15th May): Conversations Between Workers. Start by writing a few short paragraphs from the point of view of one of the tools you use for your craft. this might be a spinning wheel, crochet hook, pair of scissors or your knitting bag. These first few lines should include a description of this tool’s task and usage. If you are feeling particularly in tune with this item you might assign it feelings. Then, write a dialogue between yourself and this item. It might describe your relationships, the annoyances that you have felt for this item at some point (or could it have possible ever have felt annoyances with you) and the wonderful work that you have created together. There is always at least one day of every knitting and crochet blog week dedicated to photography and that happens to be today, day 3. The overall topic asks to post a picture of our work that is out of our norm and will keep a viewers attention a bit longer than just a few seconds. I am determined to keep all of my posts this week about my great undertaking so here is my attempt at experiment photography with my beekeepers quilt! Each puff is placed on the date I knit it. I had to get out my hexipuff journal to remind me of dates and descriptions, but it went pretty quickly. Visualizing my work like this really shows the time that I have put into the project and will hopefully continue to do so as the months go by. I may just take monthly pictures like this from now on. I typically use Pixlr Express (there is a great and easy app on my ipad and android phone) to correct a bit and add a border. I have done that with this picture as well. 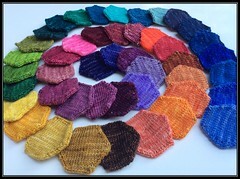 Hexipuff number 50 is on the needles – go team KnittyKitty7! KnittyKitty7 and I are just a month into this project and she is still going strong! I think it was the infusion of new mini-skeins that she received that have really kept her motivated. I’ll be interested to see how she manages to juggle watching her then 18 month old daughter, Miss E, when little brother, Sir W, makes his appearance in late July. I know that she is quite determined to stay focused on me and use my little hexipuffs as a way to stay connected with the needles and give herself some down time. 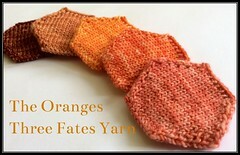 Check out other blogs participating in the 5th Annual Knitting and Crochet Blog Week! See what other projects are saying by typing 5KCBWDAY1 into a search engine!